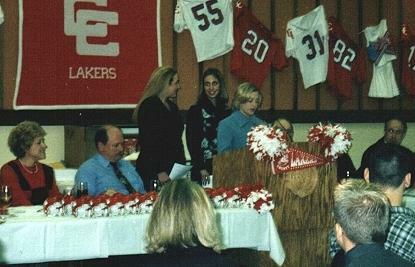 The 1999 Calloway County Laker Football Banquet was held in the banquet hall at the Curris Center on Murray State University's campus at 1 p.m. Sunday, Jan. 23, 2000. It began with the invocation and dinner, followed by short addresses to the assembly and the presentation of awards. The three senior cheerleaders, Alicia Eaves, Janna Furches, and Amy Travis, read a touching poem they had written about the 1999 Laker Football season. Since the Junior Varsity team is used as a "scout team" they were not given separate awards, but were included in the varsity awards. 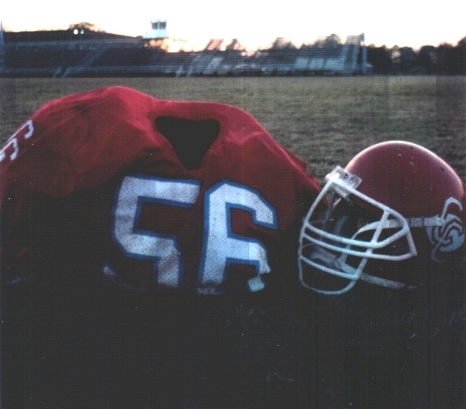 The small personalized helmet tradition was started by coach Billy Mitchell as a special memento to the seniors of their senior year. This year the helmets were also awarded to Drs. Yezerski and Bohannan in honor of their care and devotion to the team. Principal Bill Cowan announced to the assembly that head coach Joe Stonecipher had been named Coach of the Year for all AAA teams in Kentucky. He was also the number two coach of all the coaches, beaten only by the coach of Boyle County who led his team to the state championship. The Boosters handed out the senior awards, followed by the cheerleaders presenting the seniors with their own personal scrapbook of the year's events. The seniors, in turn, presented each cheerleader with a red rose. The seniors also presented a special football signed by the seniors to Kathy Jo Stubblefield for her support with displays of game pictures in the school. The various coaches announced the awards for different accomplishments and addressed the assembly to praise and encourage the team members. During the presentation of awards Ricky Norsworthy read a moving poem he had written in honor of his own son, Ryan, a senior, awarding him his own special "Father's MVP Award". After the awards were handed out the seniors presented each coach with a special gift of appreciation. A special and unique service practiced by the cheerleaders and their parents at Calloway is organizing and serving refreshments for visiting football and basketball teams and cheerleaders. This is more appreciated than you might imagine since teams are usually either on the road or just arriving at their destination when they need to satisfy meal needs. Finding and descending upon a restaurant en masse is often inconvenient (if not impossible). While a restaurant undoubtedly appreciates the business, it is a strain on working conditions. And occasionally, there just is no restaurant around. So a special "good host" award should go to the cheerleaders and their parents. Let's look at Laker Football--Season '99. The team had worked hard and was feeling fine. The eighteen senior players definitely had no fear. This was to be a "Hoo Rah Hoo Rah" year! The captains were Smith, Burchett, Hargrove, and Lowe. They were leading a team that was ready to go. There were three senior cheerleaders just full of pride. Their sixth year to take a Laker Football ride. The seniors looked back at their 8th grade year. Remembering that season brought great memories near. At War Memorial--Graves was the very first game. The Eagles will never forget our quarterback's name. The final score was 26 to 19. Our Laker Boys were fearless and mean! One week later we faced Murray High. Not a great night, we had to sigh. But the season was young and Laker pride was in place. The district games were coming--the real football race. A tailgate party and a Calloway home crowd. The Lakers downed Madisonville and we all cheered loud. The district opener was played at Lone Oak High School. The score was 28 to 0--the Lakers did rule! Now on to Union County with something to prove. The Lakers were back in a winning groove. Cameron's kick return--a big play that night! Then 2 and 0 in the district--that felt right. The next Friday Marshall County came to our town. We played great, but their "D" kept us down. The next week would be Homecoming and the stands would be full. Fulton County was in trouble--Lakers wanted no bull. Rain, rain go away--our Laker boys want to play. On the field and in the mud--the Lakers drew the Pilots' blood. So the rains came and the Lakers got wet. Hopkins Central was next--the stage was set. Hoo Rah Hoo Rah did they like our cheer? We ended their streak of winning this year! The Storm was driving with a style that was grand. But the Lakers were victorious with a goal line stand. To Tilghman we went--all wanting more. Knowing the Lakers had never won there before. The offense scored often and the Laker "D" defended. When the final horn sounded, Tilghman's streak had ended. The district was ours; there was no doubt! Now ready for Muhlenberg--to put them out. It was Senior night--we were happy and proud. Our parents with us, our friends in the crowd. I must name names; I feel I should. And families and friends, too, if I could. There was Goode and Bazzell and Yezerski-that's three. And Wallace and Wilson, and Norsworthy--you see. What a group of men--see what I mean? And Stone and Potter and Hargrove and Lowe. More of our Lakers I want you to know. Add Smith and McCuiston and Greenfield to the list. And Rogers and Corneau--who could resist? Play-off time--Warren Central would be a test. The Lakers on past wins could not rest. A perfect district record this memorable season. We Lakers fight together--there is your reason. To all coaches, sponsors, and especially Coach Joe. We admire you and thank you--we want you to know. The night would not bring a victory for our team. So it was the end of the season, it would seem. But you can't really end Laker Football. The memories made will be cherished by all. Things to think about, just part of the year. Smile and remember--don't shed a tear. Push-ups and Laker Band and practicing some more. Photos and films and trying to score. Locker rooms and Hawgs, and run-throughs and cheers. Remembering the last time and those Laker tears. The sponsors and coaches, being hot and cold. Being part of something good, to this we will hold. The bonfire, Meet the Lakers, and wearing red. Coaches and sponsors --forgetting what they said. Thursday night suppers, thanks to you all. We learned many lessons and played football. These last words from us--we want you to know. We were honored to support you--it is so. We three look back at the years one by one. Cheering for you sure was fun! There's strength in his face, though no emotion is shown. The pads, the jersey, pants, not washed this year. He knows the feel of its smashing hit. The crash of the pads, the grunts and groans; the enemy engaged. In a mighty war where inches are won. No matter how much it hurts, time after time. But tonight the battle has a different tone. Tonight you'll feel pain that you never have known. But a deeper hurt, a different pain. And you'll battle as if your soul's on the line. Your world crashes down, you can't get it out of your head. And sink in despair, as you stare at the ground. And hold them you did, as the stories are told. But alas, on this field; again, you'll not fight. This was the final, the last Friday night. And there with you on that field, I cried. I felt the pain that you felt inside. Because in my eyes, this game, you have won. As you gather your strength, once more you stand. You walked on this field a player, and you'll walk off a man. Now, I'm not a coach; just a dad, you see. But dads are allowed their own 'MVP'. And I'll never be prouder than I am right now.